Making your title available as an ebook is an important step in the publishing process, but it's not as difficult as it sounds. Here's a quick guide to get you started on making your book available for sale on Kindle -- all in 9 easy-to-follow steps. 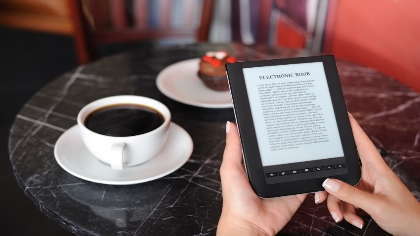 Kindle is the most popular eReader on the market, so it only makes sense that as a self-published author, you should seriously consider offering your book within Amazon's eBook store. But along with being one of the most popular options for readers, Kindle is an enticing option for self-published authors with high royalties and an easy-to-use platform via their Direct Publishing format. Head to Kindle Direct Publishing at kdp.amazon.com. If you already have an Amazon account, you can sign in with that. If not, you'll need to create an account. Once you sign in, you'll be taken to a page called Bookshelf. At the upper left is an icon that says “Add a New Title.” Click on it. There's just two main steps to complete to get your book on Kindle if you already have everything formatted and ready. Fill out all the fields for the first step, including uploading your cover and interior. The interior can be one of several different file types, including a Word Document. If you have some familiarity with HTML code, you can download the free Kindle Gen to help with formatting. Once you have the interior uploaded, make sure to use the previewer, which is just below where you uploaded the file. You can view it online or download a copy to read on your own Kindle. Since formatting can get tricky, make sure to look through everything to make sure the book looks how you want it to look. If you see any errors, go back into the document and adjust, and then upload the file again. Once you filled out all the forms, uploaded the cover and interior, and are happy with the preview file, click "Next." Now, it's time to choose your rights and pricing structure. At the top, the worldwide rights section indicates which countries you want to make your title available in. If you wrote the book, you can choose worldwide rights. Now, you have to choose between a 35 percent or 70 percent royalty. While at first the 70 percent is of course more enticing, choosing that option means you are not going to sell the eBook anywhere else. If you wish to reach a wider audience by also offering your title on Nook or other eReaders, you'll have to select the 30 percent option. You'll need to sign up for Kindle Select with the 70 percent royalty in order to use programs like the “Countdown Deals” that allow you to discount your book for up to seven days or to offer an eBook for free, so weigh the pros and cons for your own particular case. Next, you're ready to price your book. You can price the book individually over all of Amazon's stores, or you can automatically select a price for the remaining markets based on your U.S. price. At the bottom of the page, decide if you'd like to use the MatchBook program, which allows anyone who has bought your paperback to get the eBook for a discounted price. The final option is whether or not to offer lending to Amazon Prime members—if you opted for the 70 percent royalty earlier, you'll need to also permit lending here, too. Check the box agreeing to the terms and conditions (don't forget to read them), and click "Save" and "Publish"—your title will appear on Amazon.com shortly! If you choose the 70 percent royalty option, you can now visit the KDP Select Benefits option at the top of the page to schedule a countdown deal or promotion, if you choose to. Making your self-published title available for Kindle is an important step to earning a profit through independent books. But as far as writing a book goes, it's one of the easier tasks to master.